The goal of water treatment, usually from surface sources such as lakes, reservoirs, or rivers, is to remove contaminants and organisms through a combination of biological, chemical, and physical processes to make it safe for drinking. Some of these occur in the natural environment, whereas others occur in engineered and constructed water treatment plants. The engineered processes usually mimic or build on natural processes. Water-treatment concepts underlying those used today were developed in Europe during the 1700s. An outbreak of cholera in London was linked to a sewage-contaminated drinking water well in 1854. John Snow was credited with this finding. At the point in which the United States began using chlorine to disinfect drinking water (1908), Europe was also using chlorine but exploring the possibility of employing ozone to treat drinking water. The U.S. Public Health Service developed the first drinking-water regulations in the United States in 1914. The U.S. Environmental Protection Agency (EPA) later assumed responsibility for this task when it was established in 1970. The Safe Drinking Water Act (SDWA) became law in 1974, and was significantly revised in 1986 and 1996. The revisions reflected improvements in analytical methods to detect contaminants at lower levels and improvements in automated monitoring used to evaluate treatment plant performance. The revisions also started to address the need to balance immediate (acute) risks versus long-term (chronic) risks. The need to disinfect water to kill pathogens to protect against acute illnesses, versus the formation of disinfection by-products and their chronic health effects is an example of this risk balance. The United States has continued to examine water treatment practices in Europe, particularly water-quality standards established by the World Health Organization (WHO). Although there are some philosophical differences between the United States and Europe relating to the treatment of the distribution system and its operations, the United States has benefited from the European experience. One such philosophical difference is that the European water treatment community does not see the maintenance of a disinfectant residual to the end of the distribution system as a necessary public health protection measure. The United States drinking water community sees this as an important step to protect customers and the water system from bacteriological regrowth or recontamination. As the United States entered the twenty-first century, researchers were collaborating with scientists around the world to continuously improve water quality and treatment, and openly share their research findings. The EPA, under the requirements of the SDWA, regulates drinking water in the United States. The EPA additionally regulates wastewater, but under the requirements of the Clean Water Act (CWA). Storm water and discharges into surface water are also regulated under the CWA. consumption. The list includes microorganisms, disinfectants and disinfection by-products, inorganic chemicals, organic chemicals, and radionuclides. ultimately falling again as precipitation. 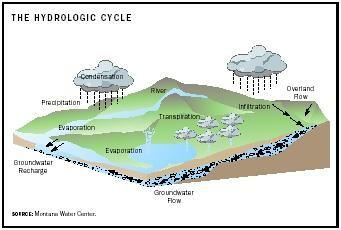 See the illustration for a diagram of the water or hydrologic cycle. Source water protection, often referred to as "watershed protection," is the reduction or prevention of water pollution at its source, represents a tradeoff between treatment plant construction and operation costs. This kind of protection is not always possible, but it has been very effectively implemented by several water systems. A water system that has access to a high-quality source may not need as extensive a treatment plant as a system with a poorer-quality source. This is especially true if a high-quality source, such as a reservoir in an isolated natural area, can be protected by limiting human activity close to that source. Water from such a source may not require the settling step, may involve fewer chemicals or smaller doses of them, or might be able to kill pathogens with strong disinfectants like ozone or ultraviolet light instead of providing filtration. AWWA Drinking Water Week Blue Thumb Kit. amount of concern about risks. A common saying in the past was "the solution to pollution is dilution." This is not the most efficient treatment method because even small amounts of pollutants, such as some pesticides, can build up, or bioaccumulate, in body fat over time. It is also not the preferred approach because it sends the message that polluting the environment is an acceptable course of action. Settling. For facilities treating water that contains a lot of solids, settling or sedimentation is a common treatment step. The process slows the flow of the water in a pond or basin so heavier items can settle to the bottom. If the water is not sufficiently slowed down, these items are carried along to the next step in the process, which is not desirable. 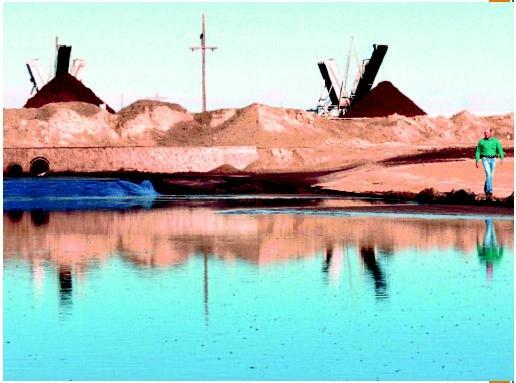 For plants treating very polluted raw water , settling may be used as the first step in the treatment plant (presedimentation) and again following the coagulation and flocculation steps. Wellhead protection is critical to preventing the contamination of ground-water supplies. Groundwater is pumped out of an aquifer, which is like a small underground lake surrounded by layers of rock and soil. Water from the surface flows through the rock and soil to get to the aquifer. The earth naturally provides filtration of microscopic pathogens. It does not always provide adequate protection against viruses or chemicals that are dumped on the ground. Groundwater typically contains higher concentrations of metals like iron and manganese because these metals occur naturally in the earth. Groundwater may also be much harder than surface water. 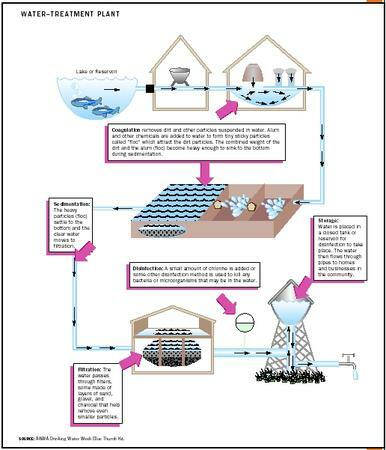 Processes similar to those outlined above are also used to treat groundwater, except that the filtration steps are often focused on removing chemicals or metals rather than pathogens. Some groundwater supplies are not treated at all, while others may be filtered and disinfected. As with surface waters, the quality of the source dictates what treatment steps are required. Water systems in the United States submit reports each month to state or federal regulatory agencies, summarizing treatment-plant performance and sampling results. The majority of medium and large water systems in the United States have staff working twenty-four hours a day. If something were to go wrong at the plant, the plant operators have procedures that they would follow to shut down the plant, switch to alternate equipment, adjust chemical dosages, or collect additional samples. State and federal regulations specify when the water plant operator must notify the state or federal agency, and these requirements are built into the plant's procedures. The regulations also specify when the public must be notified. Orders to boil the water are usually jointly issued by the state health agency and the drinking-water system quickly after a problem has been discovered (most likely via telephone and radio). Public notices about problems with routine monitoring results or the failure to collect required samples would generally be distributed in the newspaper or via the water utility's annual water quality report (also called a consumer confidence report). The requirement that all water systems compile and distribute a user-friendly report began in 1998. This report provides an overview of the water-system activities and compliance with regulations for the year, as well as identifying ways that customers can get involved or acquire more information. SEE ALSO A GRICULTURE ; C RYPTOSPORIDIOSIS ; G ROUNDWATER ; H EALTH, H UMAN ; N ONPOINT S OURCE P OLLUTION ; S NOW, J OHN ; W ASTEWATER T REATMENT ; W ATER P OLLUTION . American Water Works Association. (1999). Water Quality and Treatment, A Handbook of Community Water Supplies, 5th edition. San Francisco: McGraw-Hill. American Water Works Association and American Society of Civil Engineers. (1998). Water Treatment Plant Design, 3rd edition. San Francisco: McGraw-Hill. Peavy, Howard S.; Rowe, Donald R.; and Tchobanoglous, George. (1985). Environmental Engineering. McGraw-Hill Series in Water Resources and Environmental Engineering. San Francisco: McGraw-Hill. Symons, James M. (1992). Plain Talk about Drinking Water: Answers to 101 Important Questions about the Water You Drink. Boulder, CO: American Water Works Association. U.S. Environmental Protection Agency, Office of Water Web site. Available from http://www.epa.gov/ow . One of the problems in protecting drinking water is that by the time results of tests for E. coli or Cryptosporidium or even anthrax are known, an urban population can already be at risk. Inventors Gregory Quist and Hanno Ix are out to change that. They use laser beams to scan a flow of water; particles in the water scatter the light beam and each scatter pattern is different. A computer analyzes the pattern and provides continuous real-time identification of microorganisms. The system is being tested at a Los Angeles, California, water facility. wow so good. I wish grade ten students would read this comment and waste their time to activate their untouched potential. you have a life ahead of you, don't be boggled down with life start a better experience with the power of water treatment and purification.